In short, what a weekend… in some cases, it felt like a well-written independent film that got a lot of buzz during pre-screening, in others, it felt like a Tyler Perry movie, where a third of the way through it, you knew the ending, but sat threw it. Overall, it was entertaining and amateur sports at it’s best! 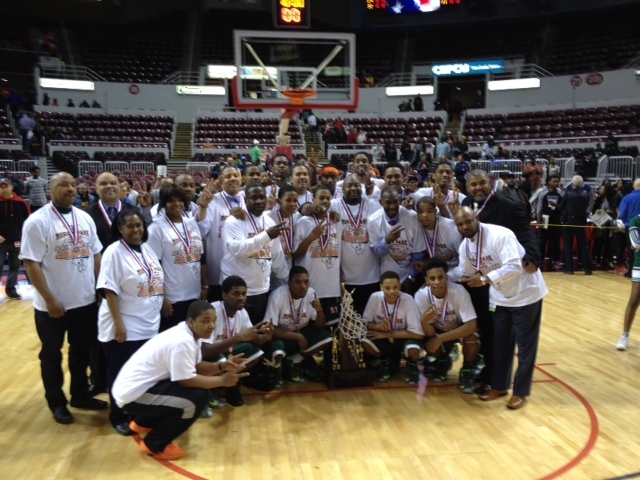 R-E-P-E-A-T for Chicago Public School’s Morgan Park (24-6) as they defeated Lincoln 59-49. There guard play is so underrated that, well, on this big stage, they led the way. It was the sophomore Charlie Moore and Jarrin Randall show. YUP, sophomores! Under a nine-point deficit at the half, the Mustangs came out with more urgency as Randall hit a 3-pointer that cut the deficit to one with a little more than 7 minutes. Shortly after that he tossed a soft pass to Moore who nailed a 3 that tied the score at 41 with 6:52 left. These shots came during a 26-2 run that spanned the third and fourth quarters. Moore finished the championship game with 12 points, while Randall added eight. Big man, 6’8″ Josh Cunningham, had the high-score of 13 for the Mustangs. On the other side of the ball, Gavin Block, led Lincoln (34-3) with 19 points. See the box score provided by Amateur Sports News Network & MaxPreps by click here. Talk about a drama filled Third place game…. WHEW!!!! 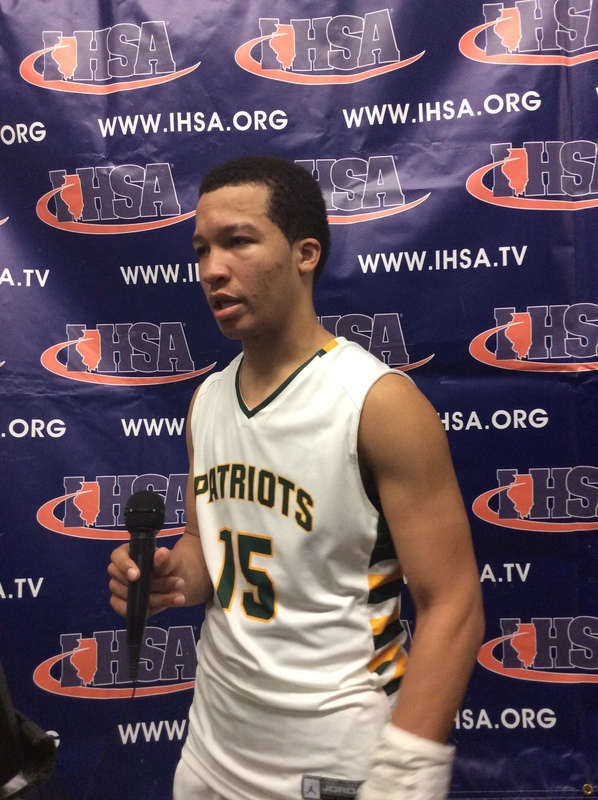 As reporters, fans and even players heard about the early news from the Illinois High School Association (IHSA), that junior phenom, Jalen Brunson was suspended from the third place contest, the atmosphere was totally buzzing during pregame and opinions were flying. Why? A low-quality photo of Brunson appearing to make a middle-fingered gesture during his record-setting 56-point performance and loss to Young in the 4A semifinal game circulated on Twitter after the game. With sportsmanship being paramount for any stage under the IHSA umbrella, executive director Marty Hickman decided to suspend the star junior. Then, Stevenson high school appealed to the board of directors, which overturned Hickman’s decision. 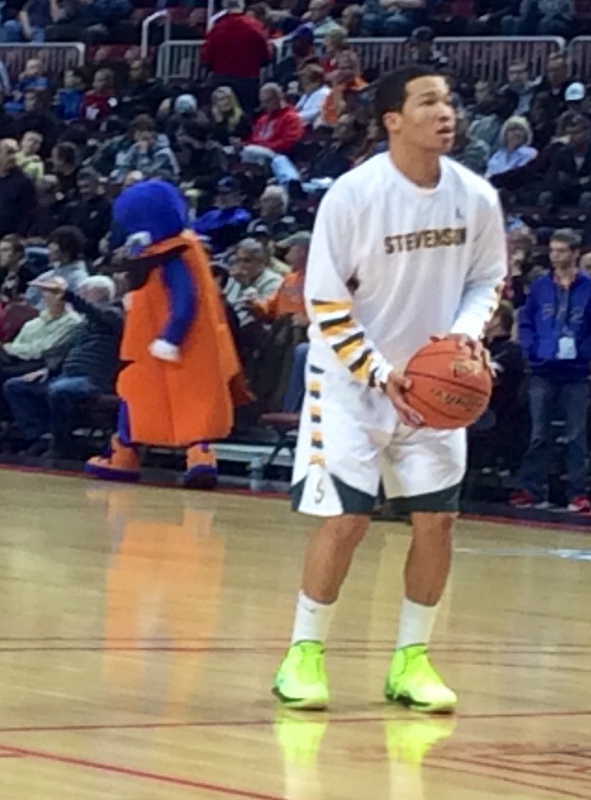 In the end, Brunson played, Stevenson won, and IHSA had no comment after initial statement. 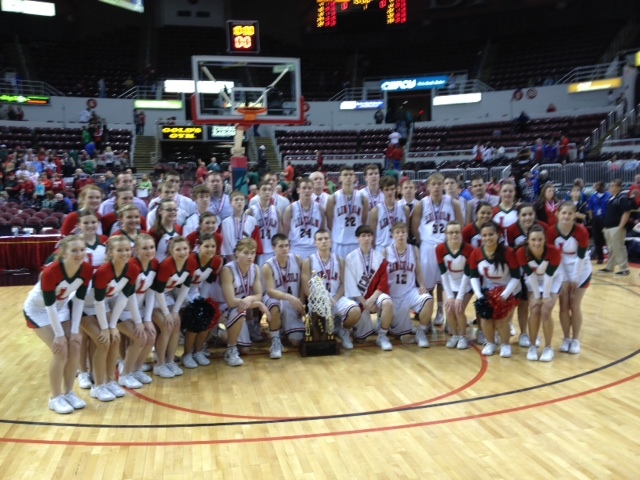 The Patriots defeated the Tigers 70-63 in the Class 4A third-place game at Carver Arena. One night before, Brunson scored a state-finals record 56 points Friday against Young in the loss, and tonight, his play was visible, but not as many points (18). It was senior Matt Morrissey who played big under the circumstances and his final high school game as he was 4-7 from teh behind teh arc and finished with 16 points. Teammate Connor Cashaw added 17, followed by Matt Johnson who contributed 10 and five steals. Edwardsville was led by senior guard Trevor Clay, who knocked down 21 points and snagged 8 rebounds, followed by Armon Fletcher, who added 15 points. When asked after the game, Brunson, who has no history of behavior issues on or off the court, did not want to discuss the incident Saturday night. He was also asked whether he was concerned people were going to get the wrong idea about him. His father, and former NBA player Rick Brunson, warned his son about the potential pitfalls of social media, and in this case it was Twitter. Overall, his father sees the ordeal as a learning experience. 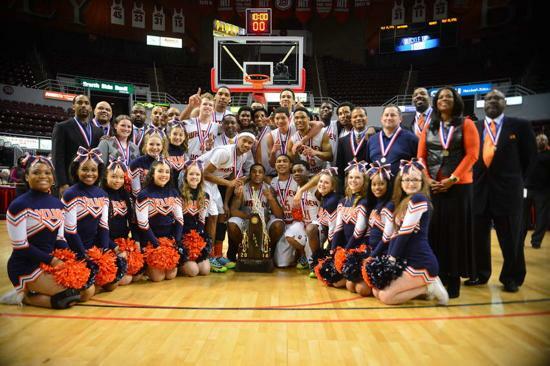 This was a Whitney Young type of season as both the Girls and Boys win State championships. The Boys defeated Benet 46-44 to win their first state title since 2009. Chicago Public Schools have dominated the last six Class 4A titles between Young and Simeon, they have won all of them during this period. 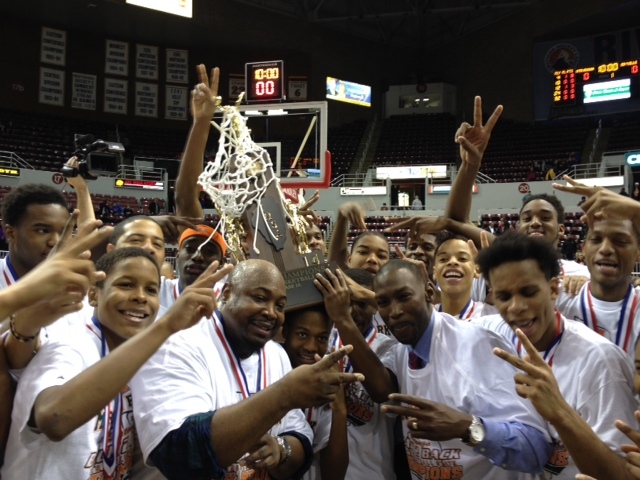 And on top of that, the Public League swept the 3A and 4A tournaments for the second straight year. Going into the game, we all wanted to see the number one player in the country, Jahlil Okafor, go up against another big man in the state, Sean O’Mara. Well, they battled but it was Miles Reynolds who performed on this stage, knocking down 19 points and keeping the Dolphins ahead all night. Reynolds, a St. Louis recruit, had the hot hand early, hitting a pair of 3-pointers and scoring eight first-quarter points to stake the Dolphins (29-5) to an 18-10 lead. The RedWings (25-8) trailed by 10 at the half and never drew even, but they did managed to make things interesting during the last two minutes as then went on an 8-0 run cut Young’s lead to 44-42 with 24 seconds to play. But another Division-1 one recruit, Paul White, Georgetown, answered with two clutch free throws five seconds later, and Young did not have to inbound the ball after Benet’s Liam Nelligan made it 46-44 with five seconds left. White finished with 8 points and 7 rebounds. Okafor finished the game with 8 points and 6 rebounds. Colin Bonnett led the RedWings with 12 points and 6 rebounds, while O’Mara had 8 points and 8 rebounds. Four teams came down…. two are left to play for the Title! NORMAL, Ill. — It was a sophomore who led them to this years’ championship – none other than 5’8″ Kiara Lewis, who secured the Class 4A girls basketball state championship Saturday evening and their third state championship and second in three years. She knocked down 20 points and was 8-for-13 from the field, including perfect from the charity stripe. Lewis scored seven points in the third quarter and her 3-pointer and assist to Taylor Malone on the ensuing possessions gave the Dolphins a 40-24 lead. During this period, they never looked back. What a fantastic way to end this season especially as Lewis missed all of last season with a knee injury. On the other side of the ball, the Mustangs (29-5), senior Jenny Vliet, played her heart out keeping them in the game as best she could. They even received a surprised gift when Texas A&M recruit, Khaalia Hillsman fouled out on a normal foul (her fourth) then she received a quick technical. This all occurred with a little more than 4 minutes left in regulations, but the Mustangs couldn’t capitalize only scoring just two points the rest of the game. Vilet finished the game with the game-high of 21 points to go with 10 boards. The Dolphins (32-3) opened and closed this season in an ironic manner – first game (December 7) they defeated the Mustangs 54-40, defeated them tonight for state bragging rights. FUN FACTS: To date, the Dolphins are on a 16 game winning streak. 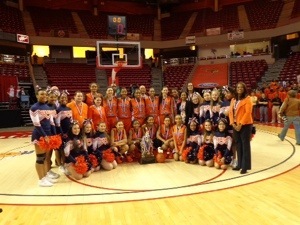 NORMAL, IL – It wasn’t perfect but it was a victory as the Spartans defeated the Vikings 45-34 in the third place state finals. Marian Catholic stretched out to a lead and never let it go behind the play of senior, DePaul-recruit Ashton Millender, who knocked down 16 points and 7 boards. But this contest was a tale of 2 halves because in the third quarter, they went super cold, and only scored three points to the Vikings 11, making the score 26-21. All of the Vikings points except two were from the free throw line. The Vikings did get the game down to three points at the 7:40 mark in the fourth when Abby Novak nailed a couple of shots from the charity stripe making the game 26-23. 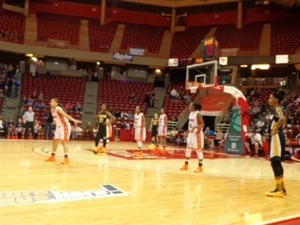 Shortly after that, sophomore guard Gabrielle Cooper knocked down a big three, 29-23. 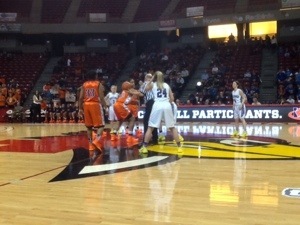 Geneva scored a field goal and Ms. Cooper did it again – nailed a needed three. This stopped the Vikings momentum and slowed down the tempo, and the Spartans will return to Chicago Heights 1-1 in this years’ state finals. After last nights loss, this was a good win for the young team to develop from. 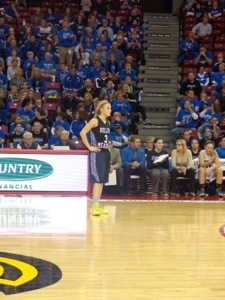 Geneva was led by Abby Novak who scored 13 points. Nice win for the Mustangs behind the play of there three-headed monsters: Jackie Kemph (13 pts), Jenny Vilet (11 pts), and Alexis Glasgow (18 pts). The Vikings lost some of their momentum when 6’1″ senior Sidney Santos fouled out with 2:54 left in regulation. She finished the game with 2 points and 4 assist, but her presence in the point was huge. Rolling Meadows will face the winner of the next contest between Chicago’s Whitney Young and returning champs, Marian Catholic. In a word… thorough! What a difference a year makes. Last year, the Spartans jumped out early and often against the Dolphins, this year, TOTAL opposite as they advance to the state finals today winning 60-20 Friday night at Redbird arena. “The feeling of last year always lingered with me, so I’m glad we were able to pull this out,” Young senior center Khaalia Hillsman said. Marian (27-5) shot 3-for-23 and Ashton Millender was held to four points during the first half. Young made 15 of its 26 first-half shot attempts for a 35-8 edge. 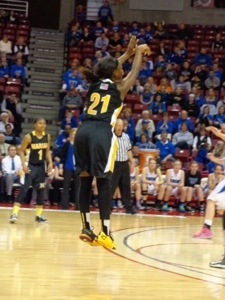 Marian Catholic didn’t reach the double-digit mark until Kauai Bradley’s 3-foot running banker in the lane 44 seconds into the second half. Kiara Lewis led all players with 15 points and 10 boards, followed by teammate Hillsman, who also had a double-double 10 points and 10 rebounds. 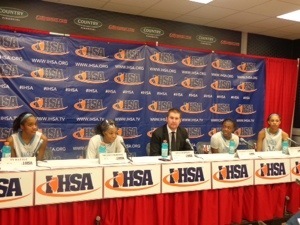 The Dolphins will face Rolling Meadows Saturday night at 8:15 p.m. for the Girls Class 4A title. Young defeated the Mustangs 54-40 in its first game this season. 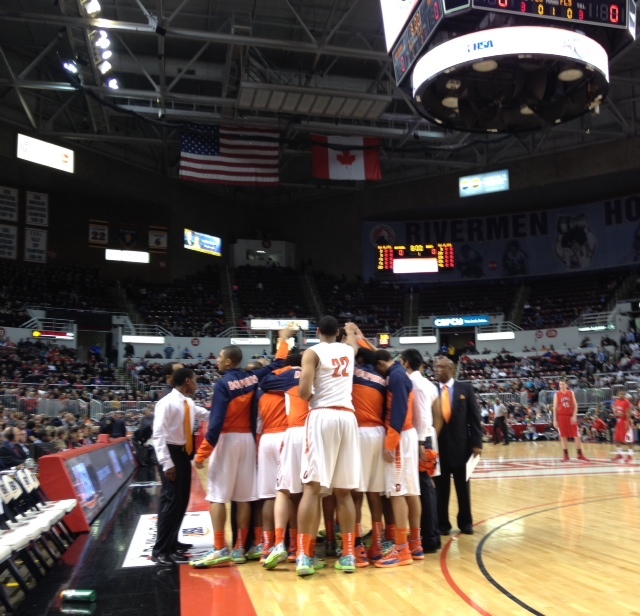 To see there road traveled to the Illinois State semifinals… click here! NORMAL, IL – The Broncos (34-2) shot with lots and lots of confidence from behind the arc to win this years’ Class 3A state title game against Joliet Catholic, 57-44. They shot 11-for-20 from downtown led by Kelly Karlis, who knocked down four, and teammates Lea Kerstein and Kateri Stone tagged teamed for three each. Kerstein finished the game with 13 points, while Stone added 12. The Angels (27-3) did cut the deficit to two late in the third quarter following a needed basket by Nicole Ekhomu’s, but the Broncos Kaylee Bambule and Kerstein responded by drilling back-to-back 3s to end the third. In the end, the Angel leading scorer was sophomore Nicole Ekhomu, who scored 14 points. FUN FACT: Montini seniors Stone, Karlis and Sara Ross wrapped up their careers with a 138-10 record. 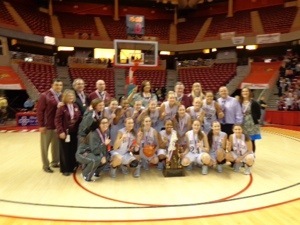 This is Montini’s fourth Class 3A state title in five years after placing third last season, and will be moving to the Class 4A bracket beginning next season. This is due to Illinois High School Associations new success advancement formula. 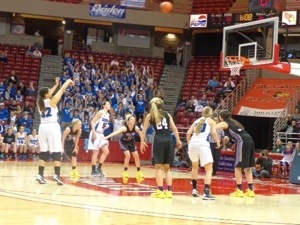 NORMAL, IL – Quincy Notre Dame leaves the state finals with a win as they run past Burlington Central, 64-40, in the IHSA Girls 3A 3rd place contest Saturday afternoon. The Raiders were led by Kristen Gengenbacher, who scored 20 points, followed by teammate Mary Beth Hugenberg, who added 19. The Rockets were led sophomore Sam Pryor who scored 10 points. 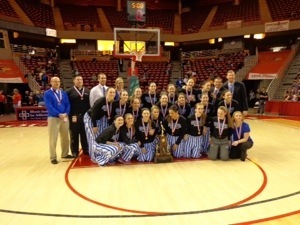 Burlington Central is the only team here at State that doesn’t start any seniors and they made this much noise? Wow, they have a very bright future ahead of them and should have a few more trips back down here. 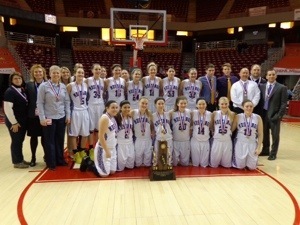 NORMAL, IL – Slow game, but the Broncos did enough to hold on and advance to the IHSA State Finals behind the play of Ohio University-recruit Kelly Karlis, who scored 10 points 5 boards and 3 steals. Teammates Lea Kerstein knocked down 8 points, followed by Kaylee Bambule who added 6. The Broncos only scored six points in 16-plus minutes spanning three quarters. Unheard of for their style of play. Then, senior guard Kateri Stone, a veteran of three previous trips to state, ended her own scoreless drought with a steal at midcourt that was followed by a layup. Inspired by Stone’s steal, the Broncos scored seven points in 49 seconds to rally back into the contest and seal the win. The Broncos (33-2) will face either Joliet Catholic or Quincy Notre Dame at 2 p.m. Saturday, the program’s fourth title game appearance in five years. On the other side of the ball, the Rockets were led by Sam Pryor who scored 11 points and 6 boards. NORMAL, IL – This game presented lots of trivia-style questions that no one “would” have ever thought “would” happen: Would the return State Class 3A finalist, Quincy Notre Dame, come out rusty on the big stage? 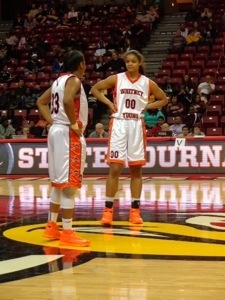 Would the Lady Spartans captain, Jasmine Lumpkin, who have fouled out of a State semifinals game? Or would the size of Joliet Catholic be a little more than Quincy ND could handle? 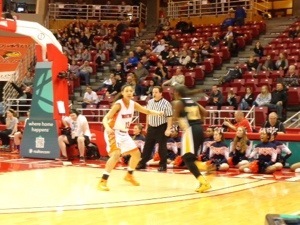 Lumpkin, a Michigan State recruit, finished the game with almost the game high as she scored 15 points and snagged 6 boards. Nicole Ekomu led the the team with 16 points, 6 boards, and 3 steals, followed by Jnaya Walker who added 15. In the end, it was the size of the Angels that won the game, and defeat last years’ champs. They will face Montini tomorrow afternoon at 2pm. Lumpkin won a couple State Championships with them prior to this weekends festivities… should be interesting! Can the Angels win their first State title? Or, will Montini be able to win another Class 3A title? Burlington Central (27-4) vs. Montini (32-2), 12:15 p.m.
Burlington Central is making its first appearance in the state finals, but it’s not likely to be the Rockets’ last. The Rockets’ has lots, I mean lots of young talent in the pipeline led by 6-foot sophomore Samantha Pryor, 5-8 sophomore guard Shelby Holt and 6-foot junior Alison Colby. They are facing a playoff-veteran, and State champion caliber team led by a pair of four-year players – 6-1 Kateri Stone and 6-2 Kelly Karlis – and featuring a deep and talented bench. “Burlington Central is a nice young team that’s going to be hungry and eager to knock us off,” Nichols warned. Joliet Catholic (27-2) vs. Quincy Notre Dame (29-3), 2 p.m.
Maybe it’s not the same team that won the Class 3A state title last year – 6-2 Jordan Frerichs and Kassidy Gengenbacher have both moved on – but there’s still enough talent at Quincy Notre Dame to make a serious bid for a fourth straight state title. The leaders of this year’s group are 5-11 senior Mary Beth Hugenberg and 5-10 senior Kristen Gengenbacher, who get a lot of help from 5-9 senior Cassidy Foley and her younger sister, freshman McKenzie Foley. 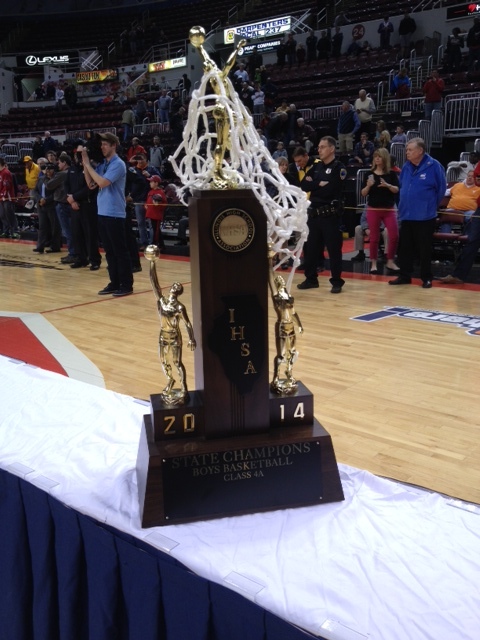 Joliet Catholic has not been downstate since 1985. Quincy Notre Dame hasn’t missed since 2009. On the other side of the court, is a championship roster as well led by Michigan State-recruit Jasmine Lumpkin, who is averaging 18.3 points and 9.2 boards. And to add a little more fire power, teammate, Nicole Ekhomu, has superb court-vision orchestrating the offense and breaking down defenses. And to top it off, she’s a sophomore who’s averaging 14.3 points, 3.0 assists, and 2.8 steals per game. This should be an exciting game. 3A players to watch: Burlington Central –- Sam Pryor, 6-0, So., F (14.4 points, 5.9 rebounds); Alison Colby, 6-0, Jr., F (8.2 points, 6.0 rebounds). Montini – Kateri Stone, 6-1, Sr., G (11.8 points, 5.1 rebounds, 93 3-pointers); Kelly Karlis, 6-2, Sr., G (9.9 points, 3.4 rebounds). 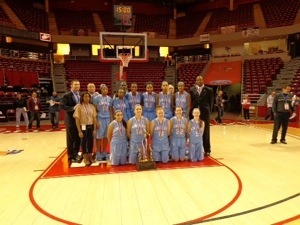 Joliet Catholic – Jasmine Lumpkin, 6-0, Sr., F (18.3 points, 9.2 rebounds); Nicole Ekhomu, 5-9, So. G (14.3 points, 3.0 assists, 2.8 steals). Quincy Notre Dame – Mary Beth Hugenberg, 5-11, Sr., F (16.3 points, 6.2 rebounds); Kristen Gengenbacher, 5-10, Sr., G (15.7 points, 3.5 assists). Marian Catholic (27-4) vs. Young (30-3), 8:15p.m. Top-ranked Dolphins (30-3) will get a chance to avenge that loss when they face defending state champion Marian Catholic (27-4) in a Class 4A semifinal at Redbird Arena Friday at 8:15 p.m. The game will follow the 6:30 p.m. semifinal between Rolling Meadows (28-4) and Geneva (26-5). Marian Catholic is riding a 14-game winning streak heading into the state finals. The Spartans have not lost since a 60-33 thumping at the hands of Incarnate Word (St. Louis, Mo.) 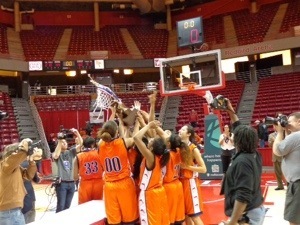 back on Jan. 11, although they needed a little late heroics to turn back Oak Lawn in overtime in the sectional finals. Teniya Page and Ashton Millender have carried the offensive load for first-year coach Dan Murray. Geneva (26-5) vs. Rolling Meadows (28-4), 6:30 p.m.
Is there a hotter team around than Geneva? The Vikings have won 14 in a row and recently got Michaela Loebel back off the DL. Grace Loberg has been a revelation for the Vikings. Since coming up to the varsity, the 6-2 freshman has averaged 14 points and eight rebounds per game. But the Vikings are facing a team that has a little bit of incentive after losing in the final seconds of the 2013 state title game. 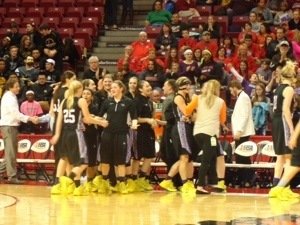 “We’ve used that game as motivation,” Rolling Meadows’ Jackie Kemph said. 4A players to watch: Geneva — Grace Loberg, 6-2, Fr., C (14.3 points, 9.0 rebounds); Morgan Seberger, 5-11, Sr., G (11.0 points, 53 3-pointers). Rolling Meadows — Jackie Kemph, 5-6, Sr., G (21.2 points, 8.3 assists); Jenny Vliet, 6-2, Sr., F (14.4 points, 9.4 rebounds). Young — Khaalia Hillsman, 6-5, Sr., C (13.4 points, 14.4 rebounds); Kiara Lewis, 5-8, So., G (12.1 points, 8.3 assists). 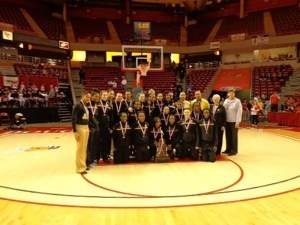 Marian Catholic — Ashton Millender, 5-10, Sr., G (16.4 points, 3.8 rebounds, 62 3-pointers); Teniya Page, 5-7, Sr., G (15.1 points, 4.7 assists).